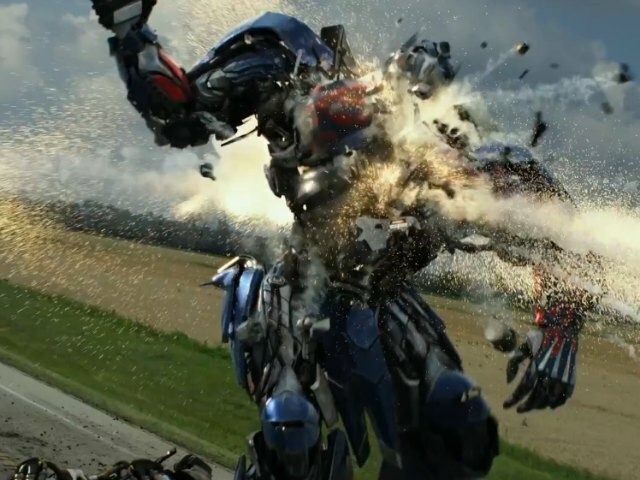 The first footage from Michael Bay’s fourth entry in the Transformers feature film franchise–Transformers: Age of Extinction–debuted Sunday night in a TV spot trailer which aired during Fox’s Super Bowl broadcast. The film brings back the series’ trademark, shape-shifting CGI robots such as Autobots Optimus Prime and Bumblebee, with appearances by a new strain of machine called Dinobots, such as the Tyrannosaurus-shaped Grimlock. Series star Shia LaBeouf will not return, and he has been replaced by leading man Mark Wahlberg. Transformers: Age of Extinction hits theaters on June 27th, 2014.